Cornerstone® – Norac Concepts Inc.
CORNERSTONE® is a non-ionic surfactant that is multi-functional and a unique surfactant blend. 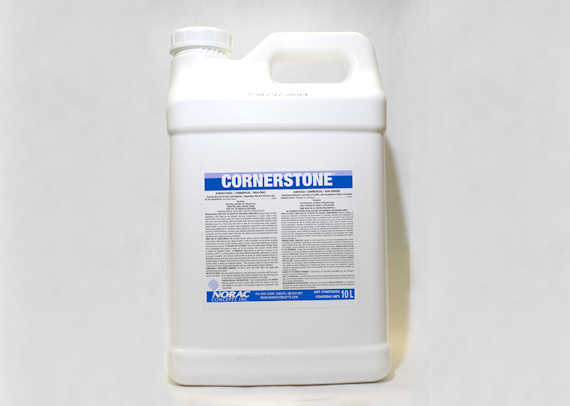 CORNERSTONE is a penetrating surfactant that is also a pH adjuster/acidifier as well as a Deposition Aid and Harvest Aid. CORNERSTONE penetrates plant surfaces for increased pesticide uptake which results in with excellent field performance with many pesticides. CORNERSTONE assists with weak acid herbicides by acidifying and buffering pH and helps with deposition and reduction of risk of drift by reducing the amount of small droplets. Available in 4x4L and 2x10L cases.